Editing apps on Android smartphones and tablets have REALLY come a long way, and you can now get some great results right on your phone or tablet device. We’ve tested a TON of apps, ranging from the simplest template-based apps that automatically generate videos from your footage, to full-blown editing solutions with timeline and multi-track support… After trying out so many options, we released a video running through the two apps we’d recommend to anyone looking to edit on Android (check it out here: https://youtu.be/LlJQAYi53OU). One of those recommendations was Cyberlink PowerDirector for Android. It’s an awesome app for creating great content right on your Android phone or tablet – and in this video we run you through a Cyberlink PowerDirector Tutorial showing exactly how to use it! This is not a full featured review and will not cover how to use every tool or feature in the PowerDirector app. We’ll be running through a full edit process end-to-end, covering everything you need to know to get you editing fast, and with great results, using your Android device. NOTE: We’ll be following the Primal Video Method, the most efficient editing process to eliminate any rework or wasted time. We did a video on this a while back (here: https://youtu.be/Ouy0cpglrc8). If you haven’t seen it yet, you can also download the PDF guide to help you with your videos: https://primalvideo.com/the-primal-video-method. So I made a easy video with editing and titles but the next night this night the layout and everything is messed up and makes no sense also on my lap top it is sideways? Come on man cough it up I need to know how to control this app!! this video rocked the cas-bah! thankya!! If I add videos using my phone then the audio is fine but if I transfer files from my camera for on the go editing…the audio is just white noise. Could it be that the app does not support that particular audio codec? Impatient to watch the whole video? Go to the share icon, click produce video, YouTube, done! Thanks, this was rather good. Does this work with 1:1 videos for instagram? Hey Justin. Thanks for the video. I’ve been having a play with this app and it’s quite powerful. I also use the PC version PowerDirector 17. Cool software! Have a great day mate! I have a question for you. I’ve used this app for a while but I’m really surprised that you can’t fade in and out and the beginning and end of the whole production. Video just stops abruptly at the end. And I’m not talking about the transitions between clips. Did I miss something? Is this better than kinemaster? Thanks made my vid look good! Oh thx man ur da best!!!! 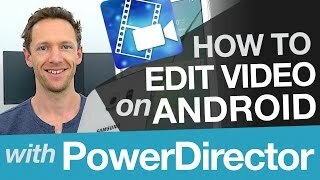 @justinbrown Hello I have a question I noticed that power director doesn’t have "moving fx" or like themes that produce your videos automatically like vivavideo app, do you know of any other editing app that is similar to vivavideo? The only problem I have is that when I edit videos with white backgrounds once I’m finished the white background turns into a yellowish background and I hate that! So i make videos out of screenshots and i need to crop them but idk how to copy that crop to every image to make it looks perfect like other people do pls help mee!!!!!! Thank you, I’ll like youre vid and the app. How can I transfer a project which is Too large ,edited in power director android app directly to my PC without saving it?